I guess some of you should have known about it, but in case you don’t know yet: GSC has just updated the official page of Nendoroid Hatsune Miku: Yukata version with more tidbits regarding her order information. This product will be on sale at the 39’s CARAVAN presents Summer Festival 2012 in Yokohama Hakkeijima Sea Paradise event. Order Dates: Orders will be taken from the 18th September until the 14th October. Products will only be available in January 2013. Order Dates: Orders can be placed between the 18th September 2012 (Tues) from 12:00 until the 1st October 2012 (Thurs) at 21:00. Estimated delivery will be in January 2013. Well, that is all you need to know about how to purchase the adorable Nendoroid Hatsune Miku: Yukata version. 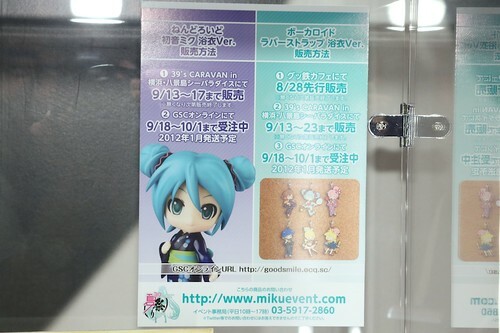 This entry was posted in News and tagged 39 caravan, hatsune miku, nendoroid, yukata. I will be truly happy with the GSC Online Shop when they offer SAL small packet as a shipping option.